The first press image of the Samsung Galaxy Tab S4 appears to have leaked, courtesy of Android Headlines who got hold of the first images it seems. 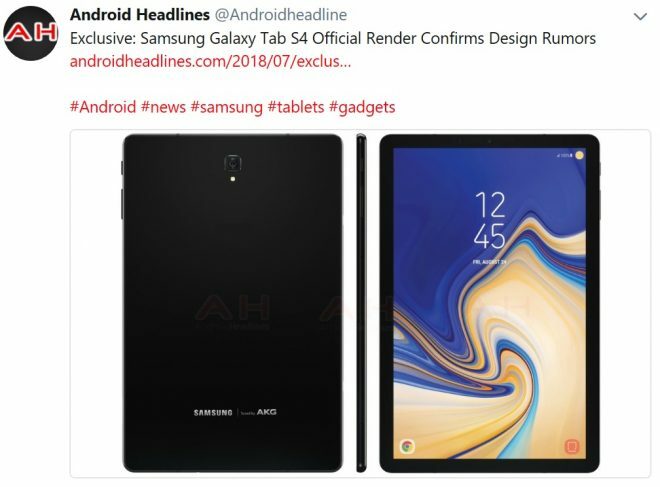 The Samsung Galaxy Tab S4 picture shows Samsung’s upcoming Android 8. tablet fromt the front, top, and back, with a design that is in line with the illustrations from the previous FCC drawings. According to the latest Russian documents I’ve seen, Samsung Galaxy Tab S4 may be launched in Russia during the world cup in football there along with the Samsung Galaxy Tab A2 10.5, so with a bit of luck we’ll see more images of Samsung Galaxy Tab S4 in a matter of days.